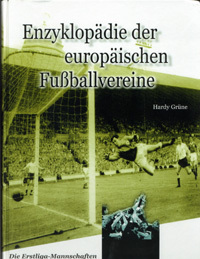 A brilliant reference work, with basic info on some 8,000 European soccer clubs. Over 500 pages of small print in a coffee table display ready hardback. Each country is profiled from a soccer history standpoint, along with relevant political/economic analysis as warranted. Want to know about soccer in the Faroe Islands? Azerbaijan? It's all here. The main criteria for club selection is that each club has to have played at least one season at the top flight - since 1883!